United Provinces Chili and Patagonia. 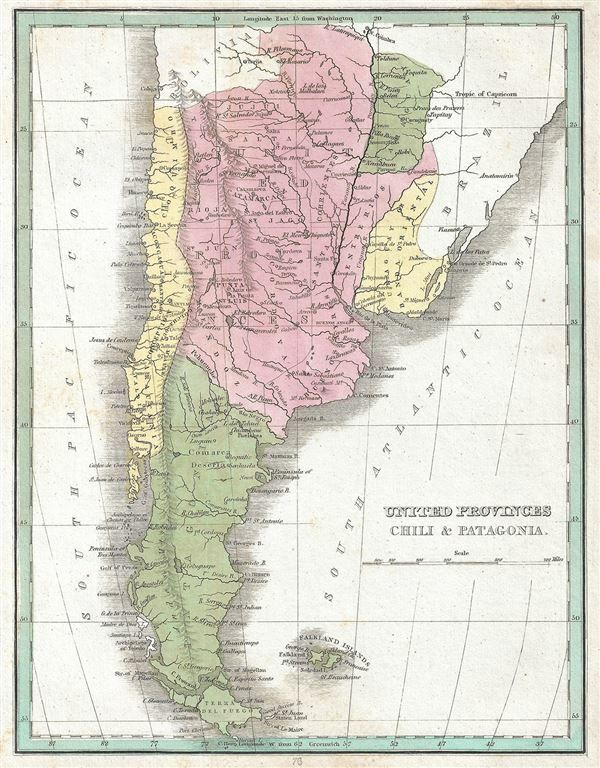 This is a beautiful 1835 map of the United Provinces of La Plata, Chile and Patagonia by the important American mapmaker T. G. Bradford. The map covers modern day Chile, Argentina, Paraguay and Uruguay. It also includes the Falkland Islands. Modern day Uruguay and part of the Rio Grande Do Sul region in Brazil, known as the Banda Oriental region before the 500-day Cisplatine War, is here noted by its original names. The Atacama Desert, today part of Chile, is shown here as part of Bolivia. Towns, rivers, mountains, lakes and other topographical features are noted. Elevation is rendered by hachure and political and regional territories are color coded. The 1828 Treaty of Montevideo following the Cisplatine War gave birth to Uruguay as an independent state. In Chile, after the last of the Spanish troops surrendered in 1826 and the failure of the federalist system in 1828, Chile adopted a moderate liberal constitution. This in turn alienated both the extreme liberal and federalist factions, ultimately leading to the revolution of 1829 and 30 years of conservative government. This map was published as plate no. 76 in Thomas G. Bradford's 1835 Comprehensive Atlas Geographical, Historical and Commercial. Bradford's atlas, published in 1835 was an important work on many levels. First, it was one of the first American atlases to follow an encyclopedic format, offering readers extensive geographical and statistical tables to supplement the maps themselves. Second, it was published in Boston and influenced the city's rise as a publishing center later in the 19th century (at the time most publishing in the United States was restricted to New York and Philadelphia). Third, this atlas was the first to contain a separate and specific map showing the Republic of Texas. Fourth and finally, Bradford's atlas in some instances broke the Euro-centric mold regarding atlas production. Among other things, Bradford focused his atlas on the Americas and abandoned the classical decoration common in European atlases in favor of a more informational and inherently American approach.